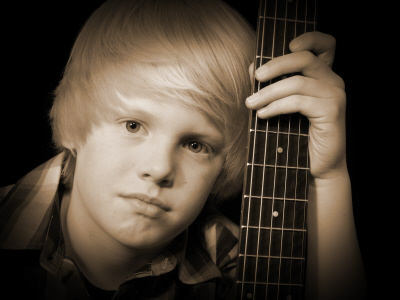 Today I’m excited to introduce for the first time on this site nine year old Carson Lueders who will amaze you with his natural talent both vocally and instrumentally. Carson began singing shortly after he started playing guitar, just after his 5th birthday. He realized that it made the song more fun to play if he sang along, and it also made his performances much more enjoyable to listen to. He was one of the only kids at his First Christmas recital to sing along while playing. His parents were pleasantly surprised to see he had good vocal pitch and tone as well as advanced guitar skills for a boy his age. Others have described his voice as low for his age with a unique raspy sound. 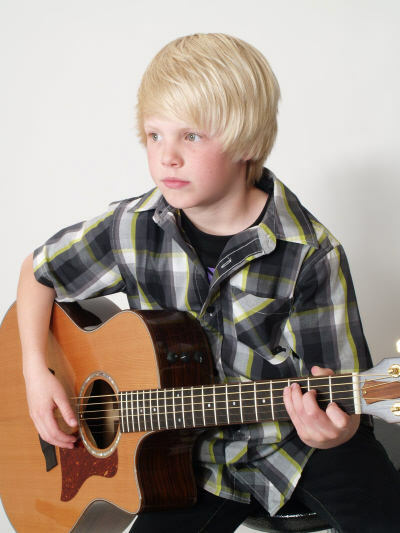 When Carson was only 4 he took an interest in guitar. He would strum on this cheap, out of tune Toys R Us guitar, showing signs of good rhythm. His parents purchased Carson a nice three quarter guitar for his fifth birthday. His Dad had taught him a few cords beforehand on his guitar which he purchased hoping to learn how to play and then teach Carson. However not wanting to teach wrong/bad habits, his parents signed him up for private lessons. Within 3 months Carson passed his Dad’s guitar skills and in turn started teaching Dad how to play. Carson is very musically oriented and will just pick up other instruments and start playing around on them. He took a few months of drums lessons and a little piano and picked both up very quickly. Because the lessons were very time consuming, he chose to keep his focus on guitar for now. Carson also plays around on his ukulele and uses the keyboard to do vocal exercises. Carson has had a number of guitar teachers. Each teacher has brought something new to Carson and he has benefited from them all. Currently Carson takes lessons at the CDA Rock School. His teacher, Kent Nelson is an amazing guitarist and they work on all types of music and on both acoustic and electric guitars. He also takes some occasional vocal lessons but realizing the importance of them, plans to start taking them on a regular basis soon. 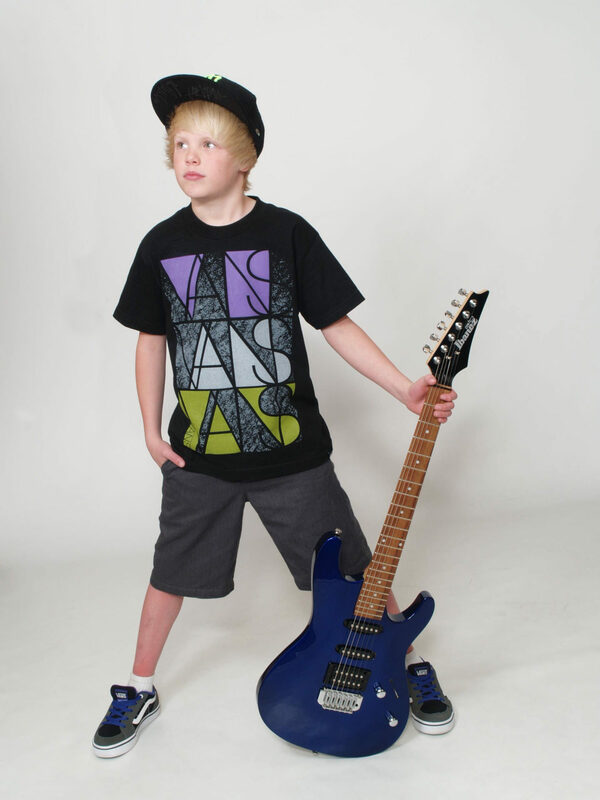 He hopes to play and perform more with bands in the CDA Rock School this summer. Although Carson prefers to play solo he knows it’s good to learn to play with others in a band. His brother Jackson, age 11, plays drums in his band. Carson’s teacher is very impressed with Carson’s guitar skills for his age. When Carson says “it’s too hard”, Kent pushes him knowing he will get it with a little time and practice. Carson can learn a new song within a few days and perfect it within a few weeks. Carson started performing at church and school at age 5. He was the only kindergarten student asked to participate in the school talent shows. (Usually 1st Grade and up) He dressed as Elvis playing Hound Dog at both and was a big hit. People still talk about it today (4 yrs later)! And he still receives many hits on his YouTube video. Playing in front of his church family was somewhat comforting but playing in front of his pier group at school was a little more intimidating. Carson is the kind of person who would rather play for 300 people at a distance than 3 up close. He continues to do the annual church and school talent shows and will perform at both places throughout the year for other special occasions. i.e. Father’s Day, at church, and Fundraiser events for his school. His favorite performance was opening for Sammy Eubanks at the Spokane Knitting Factory Oct. 2010. It is one of the biggest concert stages in Spokane and Sammy is an established country music singer that has opened for many Nashville stars, including Kenny Chesney. Sammy invited Carson to sing after he heard his original song “Big Mouth Bass” played on KIXZ96.1. Very few kids take that stage and everyone was very impressed. His most memorable time playing was for the America’s Got Talent tryouts in Portland last year. He made it through to see the producers, got an official “in the running” paper, and then got a phone interview. 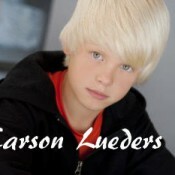 Unfortunately he wasn’t selected but the producers loved Carson and saw great potential in him! Carson said he wasn’t nervous and that it was a REAL FUN experience. He tried out again this year and made it through the second callback but did not advance any further. Carson won the 2010 August Colgate Country Showdown songwriting contest. Hundreds of artists entered original songs and fans voted for their favorite. Carson also won the local round of the Colgate Country singing competitions in 2009 and 2010. He was the only kid competing among adults and was chosen to move on to the state level. (2009 state in Idaho and 2010 in Washington) The Colgate Country Showdown is one of the largest country music talent search contests in the U.S. LeAnn Rimes won the this contest years ago. It is now called the Texaco Country Showdown. Carson was invited to play on two local news stations this past summer recognizing his original songs and the Colgate Country Showdown songwriting contest. He felt very comfortable during the interview and playing live. Carson would like to write some pop songs but he’s not sure he’s ready to write love songs just yet. He definitely likes girls and the girls LOVE Carson! Over 50% of his YouTube viewers are young girls from all over the world. His golden blond hair and charming looks coupled with his excellent vocal abilities makes him a sure candidate for fame following in the shoes of young Aaron Carter who captured the attention of so many at this same young age. 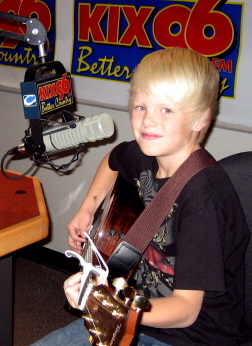 Carson was invited to play on Spokane’s KIXZ96.1 country radio when he was only 6 years old. He has since been on the radio at age 7, age 8 and age 9. Last time on the air he played for the Children’s Miracle Network charity to raise money for local hospitals. DJ Coyote loves Carson and has an open door for him to come back and play anytime. In addition he continues to be invited to perform at various venues and charity events and is now beginning to be hired for some girl’s birthday parties. ************************‘Woohoo’!!!! Other country favorites are Tim McGraw, Rascal Flatts, Brad Paisley and Little Big Town. 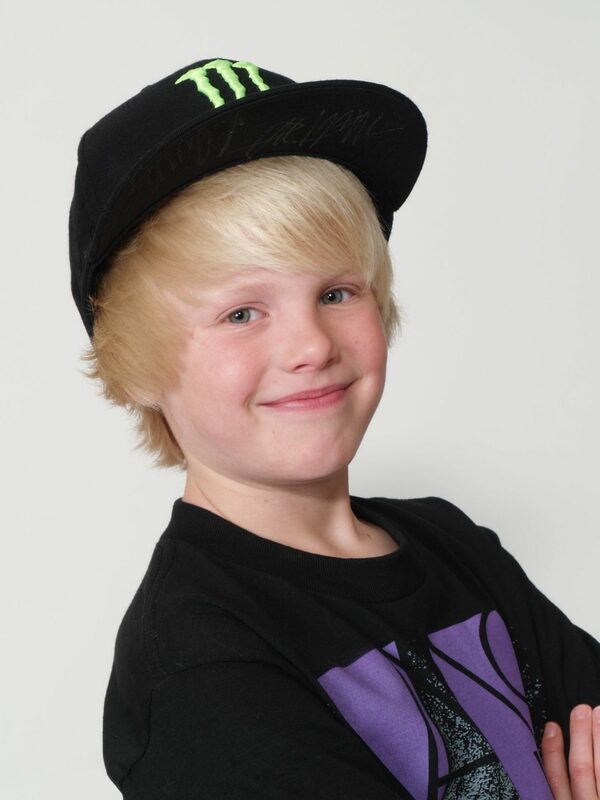 Carson’s favorite Pop Artists include: Justin Bieber, Usher, Rhianna, Jason Mraz, Train and Daughtry. His favorite Rock Artists are: Tom Petty, Steve Miller, and Elvis. Carson believes his talent is a Gift From God. He wants his music to bring joy to others. He isn’t wrapped up in becoming famous but says it would be nice to make some money. His mom would like to see his generation of music positively influence people and make a difference in the world. She feels Carson could be a lighthouse and positive role model. Carson says if the music career doesn’t work out he wants to become a doctor like his Dad. Or both, doctor by day…..rock star by night!! 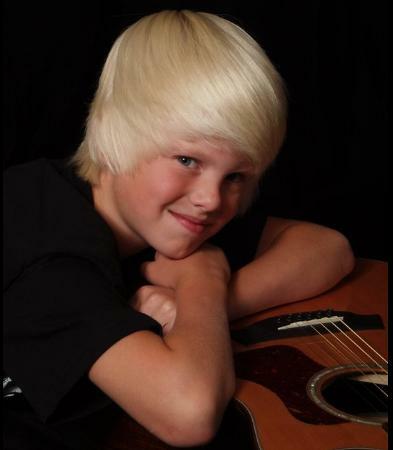 Carson is so grateful for the music opportunities that have come his way so far. He knows there are a lot of equally talented kids out there and feels blessed that he is recognized for his talent. Carson is still young and isn’t trying to rush into things. His parents are firm believers that God will give him what he needs at the right time. He hopes to get into the recording studio this next couple of months and put out some interesting videos. He has a passion for special needs kids and wants to go on mission trips to visit orphans. I like you so much Carson, because you have so beautiful voice and you are so cool 🙂 You are very talented! Thank you very much for all your music videos! Fantastic article Carson! While it speaks great things about your wonderful abilities and talents, I hope everyone knows that in addition to that you are just an awesome young man that we are all very proud of. Keep the faith and keep it coming from your heart. Enjoy the day! Hugs from a proud fan!! Thanks for your comment Tommy! I so much appreciate our friendship. As both blogs grow I’m sure we will be sharing more and more of these young peoples success stories! Your a great friend and I’m so happy that we can work together to help promote these very talented youngsters! Carson is a fantastic kid I love his music and his drive…It was a great honor to get to know him when I done his artiicle….he is a great friend. Previous Previous post: Connor Blackley of Florida 2011 X-Factor Hopeful!